First it is important to determine if you have a combustible dust hazard. Under certain conditions wood dust is potentially combustible and does present an explosive dust hazard. However, other dust such as mineral dust is not an explosive dust hazard as it cannot combust. Size and moisture is also important. If you have any doubt, you must send your dust to be tested by certified facility. There are various testing options including a comprehension OSHA Combustible Dust NEP Test designed to meet OSHA National Emphasis Program for Combustible Dust. 2017 – AWFS, Las Vegas, NV – Dust Collection And Combustible Dust for Secondary Wood Operations: Fundamentals and Safety. This session combines basic dust collection fundamentals with information on combustible dust for medium to large woodworking plants. You will also get the latest safety updates on the combustible aspects of dust and how to prevent an explosion. Find out what standards and regulations you should be reviewing and how they affect your company. Learn what role NFPA and your insurance company play and how to mitigate the impact of an OSHA inspection. 2016 – IWF Atlanta, GA, Educational Conference, August 2016 – Combustible Dust…an Explosive Issue Speaker: Jamison Scott, Air Handling Systems. Combustible dusts are fine particles that present an explosion hazard when suspended in air under certain conditions. But is it not that simple, what actually is Combustible Dust? Co-Op Woodworking Machinery Dealer Training, June 2016, The James L Taylor Companies, Poughkeepsie, NY. Comdust seminar for woodworking machinery dealers. NWFA (National Wood Flooring Association), April 2016, NWFA Expo, Charlotte, NC. Co-Op Woodworking Machinery Dealer Training, October 2015, Safety Speed Mfg, Ham Lake, MN. Comdust seminar for woodworking machinery dealers. 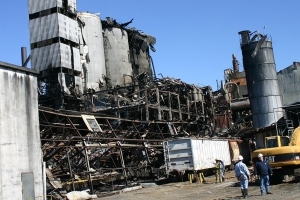 Pallet Enterprises, July 2015 – Explosion Hazard Prevention: Basics of Combustible Dust Concerns and Technical Resources. Powder Bulks Solids, March 2015 – Combustible Dust: It’s Explosive. The top four reasons people are concerned about combustible dust include: 1. health and safety of employees; 2. fear of a potential OSHA inspection; 3. already had an OSHA inspection; and 4. the possibility of an explosion. IWF Atlanta, GA, Educational Conference, August 2014 – Combustible Dust…an Explosive Issue Speaker: Jamison Scott, Vice President: Air Handling Systems. Air Pollution Control, June 2014 – An Explosive Topic. This article profiles the applicable standard-setting organizations and gives tips on dealing with dust. Where comdust is concerned, understanding the seriousness of the issue and using common sense are paramount in mitigating risk and ensuring a safe and productive work environment. Staying current on both OSHA and NFPA standards also helps. Author Jamison Scott. Cabinet Makers Association, Pro Ed Series Webinar, March 2014 – Comdust: An Explosive Issue. Become educated on prevention of dust explosions as well as mitigating impact of government inspections related to comdust. Presented by Jamison Scott, EVP of Air Handling Systems. ASSE Region 8 New England Area Conference, Providence, Rhode Island, December 2013 – Comdust: An Explosive Issue. Become educated on prevention of dust explosiond as well as mitigating impact of government inspections related to comdust. Presented by Jamison Scott, EVP of Air Handling Systems. WMS Combustible Dust Seminar, Toronto, Canada, October 2013 – Combustible Dust: An Explosive Issue. Understand who is in charge. Become educated on prevention and inspections. Presented by Jamison Scott, Chairman, WMMA Comdust Task Force and EVP of Air Handling Systems. Wood Products, September, 2013 – ComDust Prevention: Woodshops Take Note. Comdust has become a top health and safety issue in the woodworking industry. Companies with as few as nine employees are being targeted for ComDust-related issues by OSHA. Read more in this Wood Products article by Jamison Scott, EVP, Air Handling Systems. AWFS Combating Combustible Dust Seminar, July 2013 – This seminar will go into detail explaining exactly what comdust is and talk about who is in charge of comdust issues at the shop level and within government and discuss the applicable voluntary consensus standards. Can it really happen in a woodworking facility? Gain invaluable knowledge on how to prevent an explosion and tips to mitigate an impact of an OSHA inspection. This is a valuable seminar for plant managers, maintenance staff, operation directors and woodworking facility owners of ALL sizes. By Jamison Scott VP, Air Handling Systems. Center for Woodworking Innovation/CabinetMakerFDM — Combustible Dust and Regulation Safety Webinar, February 2013 – By Jamison Scott VP, Air Handling Systems. Wood Industry — Dust…Spark…Inferno, January 2013 – Combustible dust is a deadly wood-industry hazard. Positive steps can help prevent explosions from two sources: regulations and fire. Woodworking Network — ComDust: What Woodworkers Need to Know, December 2012 – Combustible dust is a serious issue. It has become a top health and safety issue in the woodworking industry, By Jamison Scott VP, Air Handling Systems. FDM Asia — Combustible Dust — An Explosive Issue, October 2012 – Prone to explosions, combustible dusts are a safety hazard. However, this can be prevented by taking the necessary preventive measures, By Jamison Scott executive VP, Air Handling Systems. Combustible Wood Dust Presentation, IWF, August 2012 – Combustible Wood Dust seminar presented by Jamison Scott, at the Technology Theater at the International Woodworking Fair in Atlanta, GA. Absence of ComDust Rule Doesn’t Stop OSHA Enforcement, Woodworking Network, June 2012 – While OSHA currently does not yet have a formal combustible dust standard, that is NOT preventing OSHA inspectors from issuing citations related to comdust using current regulations, by Jamison Scott. Air Pollution Control, October 2011 – What is combustible dust? Do we have it in our plant? Who is in charge of safety? These and others questions are answered in this article. Comdust Presentation, May 2011 – Jamison Scott of Air Handling Systems delivered an update on OSHA industrial and wood dust standards to some of the 176 attending delegates at the 2011 Wood Industry Conference in Marco Island, Fla.
CabinetMakerFDM, November 2009 – A status report on new regulations and standards that will affect how woodworkers handle comdust hazards. myDustExplosionResearch.com – The purpose of this website is to build a community around dust explosion prevention, protection, and research. The goal is to connect the dust explosion community to increase awareness of combustible dust hazards, and provide useful and educational material to powder handling industries, regulators, equipment and service providers, and researchers.